Sesquiterpenes, 15-carbon compounds formed from 3 isoprenoid units, are secondary metabolites produced mainly in higher plants but also in fungi and invertebrates. Sesquiterpenes occur in human food, but they are principally taken as components of many folk medicines and dietary supplements. Moreover, sesquiterpenes could become a rich reservoir of candidate compounds for drug discovery as several sesquiterpenes and their derivatives possess interesting biological activities. Recent efforts in the research and development of new drugs derived from natural products have led to the identification of a variety of sesquiterpenes that possess promising anti-inflammatory, antiparasitic and anti-carcinogenic activities. On the other hand, some sesquiterpenes can cause serious toxicity and other adverse effects. Therefore, more and more attention has been paid to the investigation of the mechanisms of biological activities of sesquiterpenes in vitro as well as in vivo. 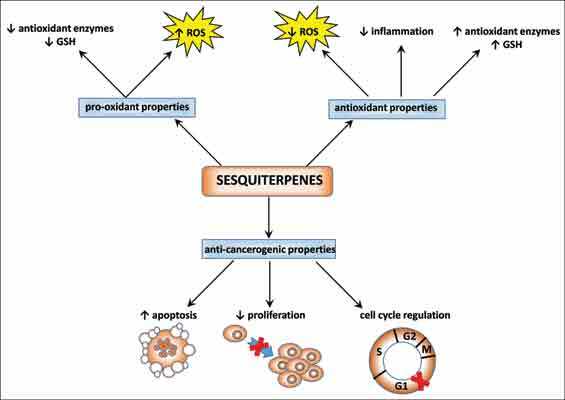 The data collected in this review show that many of sesquiterpenes biological activities are based on antioxidant or pro-oxidant actions of sesquiterpenes. Structure, concentration, metabolism as well as type of cells determine if sesquiterpene acts as anti-oxidant or pro-oxidant. Therefore, detailed research of sesquiterpenes is very important for evaluation of their efficacy and for their safe use. Antioxidant, Cancer, Chemoprevention, Inflammation, Pro-oxidant, Sesquiterpene. Department of Biochemical Sciences, Charles University in Prague, Faculty of Pharmacy, Heyrovskeho 1203, Hradec Kralove, CZ-500 05 Czech Republic.